Hi everyone! Since Ninja F is hideously incompetent and I am really the brains behind this operation I thought I would handle this week's post. Everyone has seen this at this point I assume? 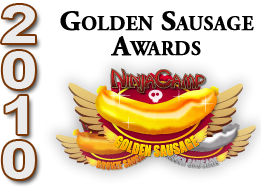 Well, here at NinjaCamp we fully support drug-induced rainbow orgasms as much as the next digital ninja company. In fact, we loved it so much we made a fabulous tshirt about it! Please head over to our store and buy this immediately. Go! Now, listen to me. This is important and I want you to know our stance on this. Some of you may wonder "Ninja S, if I go around town wearing your amazing rainbow shirt, won't people think I'm gay?". First of all, no. No they won't. Rainbows can mean other things too! Besides, this is a double rainbow. This is not the gay pride symbol. Second, you're a right-wing bigot and I don't like your attitude. NinjaCamp does not condone such behavior. Leave at once, simpleton!